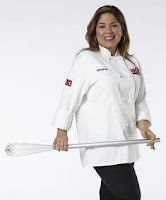 The Talking Box: Cake Boss: The Next Great Baker: Finally! No More Minerva! Cake Boss: The Next Great Baker: Finally! No More Minerva! Chad's first comment this show really caught me by surprise. He mentioned that the poor bakers are gone now, but Minerva is still there! And we all know how bad she is. Luckily, Megan and Heather G. are quickly shown talking about how Minerva shouldn't be there anymore. I don't think that anyone here should be surprised that I completely agree. Of the nine competitors left, I wouldn't completely hate any of them winning. Sure, I have my favorites, but it IS getting more difficult to rank them these days. I am really glad, though, that Buddy said at the end that Minerva should have left before Jasmine, Tony, AND Wesley. So true! Elimination Challenge: Make an Engineered Cake that does something unusual and unexpected. They get 10 hours in a single day to do so, and get fifteen minutes to plan before they can go shopping at a local hardware store (and apparently spend whatever they want). Joey and Frankie are the guest judges, and afterward, they take a chainsaw and a sledgehammer to the losing cakes out at the loading dock. [I dunno. I just expect this sort of thing from this show, so I wasn't nearly as surprised as some of the competitors were. Cake 1: Melo [42, retired cop, from Worcester, Mass.] isn't worried about doing this cake, though many others are worried about the size and intensity of the project. The team decides on a theme park cake, including a Ferries Wheel, a water slide, teacups, a dragon, and a volcano. Melo works on the dragon in particular. [and the detail on is was GREAT! loved the scale work on the fondant in particular.] Chad [43, coaches HS basketball, works at a bakery, competes in drag queen pageants, from Dallas.] is in charge of the teacups, but since they didn't get balloons they're trying to dip blown-up condoms into warmed chocolate to form balloons. He struggles, since the chocolate pops the condoms. The end result is NOT teacups. In fact, they look like ashtrays in the end. [Buddy's words, not mine! Though I agree that they weren't great. They're on the lower right side of the photo.] They use a fog machine to make the "smoke" come out of the eyes of the dragon. Nadine [27 from NYC] was the other member of the team, but we don't see a heck of a lot from her, though it's implied that she did the lovely detail work on the carousel. She does, however, point out that she would have chosen these two guys as her teammates anyway, so she's extra-happy that she chose the immunity. [she's growing on me. Chad is not. I'm pretty in-the-middle about Melo.] 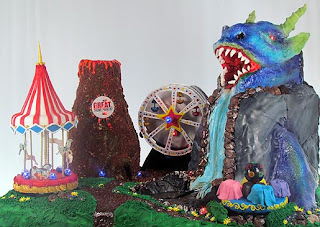 They present it to Buddy with a spinning carousel, confetti volcano, smoke out the eyes, and rotating Ferris Wheel. They win. Cake 3: Marissa [24, has a culinary school background, from Pompton Lakes, NJ.] initially freaks out about the idea of Engineered Cakes. She talks about doing a carnival or amusement park with rides, like a carousel, tea cups, and a balloon ride that spins. At the store, she doesn't really know what she's looking for, but at least she's picking things up. Minerva [43, from Miami] takes her time (as always!) picking up just one item. [I don't know that Marissa is going to last that much longer... she needs to know more.] Marissa is worried when she finds out that the other team is also doing the same theme, but that's not really their biggest issue. Minerva wants to do the people, but she's pretty slow and Marissa starts re-making people. Minerva confronts Marissa about being critical, but no real progress is made. They struggle to get the carousel working at the last minute, so they stuff in some fondant to keep the motor from pushing in on the cake. The cake looks bad in some places, and some plywood can still be seen. Marissa knows it's bad, but doesn't have a lot of other options that late in the game. Heather M. [32, exotic dancer, from Vegas] was the third member of this team, but wasn't showcased very much. When they present the cake to Buddy, the carousel won't really spin, then spins really fast. Luckily, the other objects work fine. They're told that the cake needed more detail and a better overall look. When talking to the judges, Minerva says that she received a lot of criticism from Marissa, and Marissa says that she felt Minerva needed a push. I am also glad she is gone. I have read a lot about Buddy being insensitive to her condition and I do not agree at all. Minerva certainly didn't care about arguing or pushing a pregnant woman out of her way. Ridiculous! I feel like if menirva had gone home after that challenge when she had a migrane or a "dizzy spell"....Wesley maybe would not have been shipped off in the Army.......R.I.P Wesley Thank you for serving out country!